Give children a safe, secure, comfortable ride in these lightweight, yet sturdy buggies. 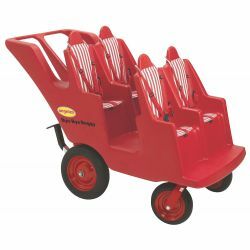 High back seats provide excellent body support and terraced seat design allows each child to see. Fits through standard doorways and is easy to maneuver in tight spaces.